In our continuing series to learn more about the Arctic Research Program (ARP) at OOMD, this month’s article is about the International Arctic Systems for Observing the Atmosphere (IASOA). This group coordinates the activities of individual Arctic observatories to provide a collaborative international network for Arctic atmospheric research and operations. Like many of our observing groups, this research includes researchers and scientists from many different institutions across the world. Nations including Norway, Russia, Greenland, Canada, U.S. and Finland support independent observatories that collect the data. ESRL is involved with IASOA by supporting their website and shared data collection network for the different participating observatories. ARP also supports IASOA by funding scientists to set up meetings between IASOA members and help support instrumentation; deployment and maintenance costs; and facility leases for Canadian and Russian observatories in partnership with Canadian and Russian governments, Arctic research agencies and academic institutions. 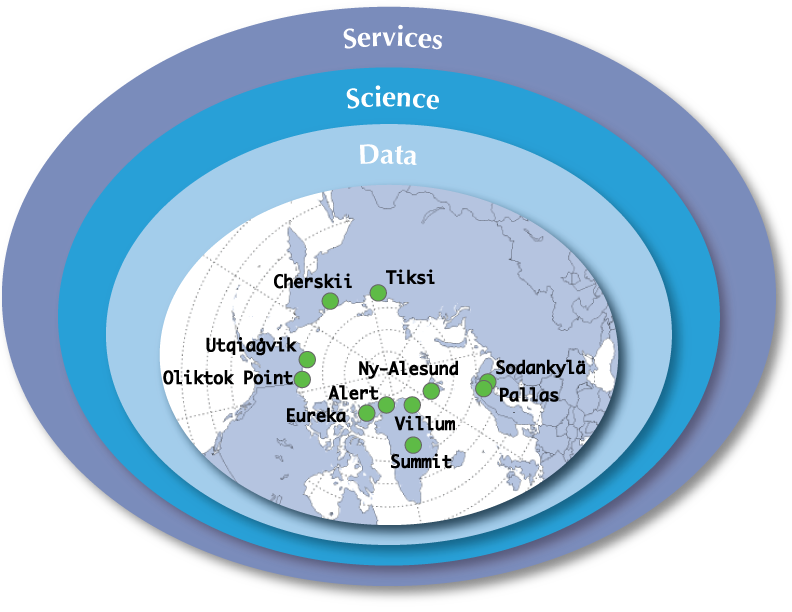 Arctic observatories in IASOA are a collaborative effort in each Arctic nation. Two U.S. observatories that are part of the IASOA consortium are Barrow, Alaska and Oliktok point, Alaska. These two observatories are a joint effort between U.S. federal agencies. The U.S. Department of Energy pays for the operations of both observatories. The National Science Foundation and NOAA also help to support operation and data collection at these two U.S. observatories. These observatories play a large role in Arctic research and are different from weather stations in that they collect basic meteorological data as well as atmospheric data. Basic weather data is taken at the different observatories including temperature, wind, precipitation, and pressure. Atmospheric data taken includes information about clouds, composition of liquid in the atmosphere, amount of sunlight, and the amount and type of greenhouse gases in the Arctic air. Greenhouse gas measurements as well as black carbon are essential parts of Arctic data collection because of their effect on the atmosphere. While some of the international agencies take other specific measurements, this data is generally the standard for Arctic observatories. Every Arctic nation is looking for the same answers regarding their environment so the participating nations discuss relative instruments and share data findings. The data collected is used for monitoring and fundamental Arctic climate analysis by the international research community. Participating agencies submit their data findings to IASOA and it is posted to a data portal available to the public. Collecting a wide range of atmospheric data allows Arctic scientists to better understand the composition of the Arctic atmosphere and how it can contribute to a changing Arctic environment. A large advantage with having data from many different geographic areas is that researchers are able to see a full picture of the Arctic environment and can strengthen studies into studying the changing Arctic ecosystems. Currently, IASOA has ten participating Arctic observatories with several more observatories requesting to join the consortium. IASOA is an incredibly collaborative program as it includes six different countries as well as government agencies, private science institutions, and academic institutions from the different nations. IASOA sponsors weekly science meetings with representatives from the participating observatories. Here they share data and findings, as well as scientific expertise and collaboration on publication of research papers. IASOA is a keystone for the mobilization of Arctic research networking to support national and international research.